Stress-timing and meters aren’t merely the stuff of poetry – their everyday use in conversation and song reveals a fundamental pattern in language skills. Do you feel the rhythm? Or a French rythme, Spanish ritmo, Swedish rytm, Russian ритм (ritm) or Japanese rizumu? Is there a difference? Perhaps one way to find out is to have a French conversation, German konversation, Spanish conversación, or Italian conversatione? Doing so will of course reveal many differences, but languages of the world also share much, just as these words demonstrate. For millennia we have been singing, dancing, clapping, drumming and talking to a beat. Just like the evolution of our DNA, languages have cross-pollinated, overlapped and changed, but at a far more rapid rate than our bodies. But are linguistic rhythmic patterns really universal? An extensive 2010 Oxford University study comparing a series of rhythm algorithm measurements for English, French, Greek, Russian and Mandarin found – “surprisingly”, as the study itself expressed – that none of these languages could be separated, and that languages do not have dramatically different rhythms. It found variants came far more from individual speakers than the rules of the language itself. So perhaps universal patterns of rhythm aren’t so surprising after all. Could the instinct for rhythm in language be innate and echo Noam Chomsky’s theory of universal grammar, that we are all essentially hard-wired to form sentences? The answer lies in the weight of syllables. Languages use rhythms composed of syllables that are variously stressed and unstressed, all in a variety of patterns that, though discernible and often complex under analysis, we mostly use unconsciously. A mother’s heartbeat may be the first rhythm most of us hear. Its pattern, often described as an unstressed (short) sound followed by a stressed or longer one (di-dum or short-long) is also one of the most fundamental and international – the iambic meter. The iambic pentameter (five “feet” or repeats of this) make up the building blocks of Shakespeare: “Shall I compare thee to a summer’s day? … Rough winds do shake the darling buds of May” (Sonnet XVIII). This meter and many other variants, such as the trochaic (long-short), or anapaestic (short-short-long) derive from Greek and Latin, but are dominant not only in English but many other European languages. Classical Chinese and Arabic poetry also use meter systems, with the latter echoing the long and short stress patterns of Latin and Greek. Stress patterns occur in everyday speech and songs, not merely high forms of literature. Rhythm in song lyrics is vital, but the rules, in both English and other languages, are sometimes complex. Serge Gainsbourg, for example, skips across a variety of meters in Le poinçonneur des Lilas (The ticket puncher at Lilas) and in the repeated chorus line “Je fais des trous, des petits trous, encore des petits trous …” (“I make holes, the little holes, more little holes ...”) he uses the iambic meter to enhance the ironic repetitiveness of the ticket puncher’s job. Song lyrics tend to mix up meters, and in hip-hop, they can become increasingly complex. Alphabet Aerobics by Blackalicious is a notably accelerating example. Hip-hop is not exclusive to British or US artists and similar rhythmic patterns echo in the work, for example, of Senegal-born French star MC Solaar, and his urban-setting take on the wild west, Le Nouveau Western (also sampling Gainsbourg, no less). Another interesting example is that of the Algerian artist Kamal el Oujdi, who raps in Arabic on a wonderfully eclectic Gypsy-Arabic collaboration with the Specials’ Terry Hall, Damon Albarn and British-Asian artist Mushtaq to combine meters and melodies across at least two languages. Children learning through rhythm, often by a method of repetition, is key to all languages. A study at the Northwestern University, Chicago, found that playing music, particularly when developing a sense of rhythm, can also boost language-learning skills. In one test it found a strong parity between reading ability and those able to keep accurate time to a series of beep sounds. What happens then when the natural rhythms of language are changed? At school I had a maths teacher who would deliberately mislead us by running sentences into each other, stress subordinate syllables or inappropriate words, and look at one pupil while addressing another. The result can create confusion, and change meanings. Foreign language speakers are often reminded of the importance of stressing particular words, such as with this class for Russian speakers, highlighting the “alternating ups and down” of English. So for example in “Mark has bought a bag in Paris”, failure to stress the words, Mark, bought, bag, and Paris would make this sentence much harder to understand. The same multilingual teacher, Luca Lampariello, has explored why Scandinavians seem to pick up the natural rhythms of English so quickly – arguing it is primarily because of extensive exposure to English-speaking media. But are there any key cultural differences in how rhythm is used across languages? 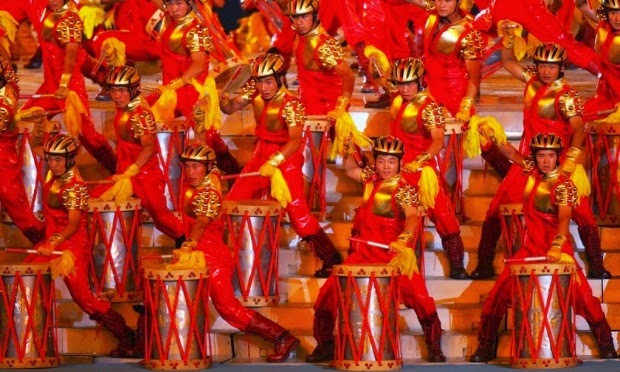 A 2006 study comparing Japanese and American-English speakers identified a fascinating difference in the perception of rhythm. When subjects were played a series of alternating long and short songs, the American-English speakers afterwards described this pattern as short-long (the iambic pattern again), but Japanese speakers perceived it has long-short. When tested again with sounds of alternating volume, both agreed the pattern was “loud-soft”, still leaving remarkable parallels in how cultures use and perceive language through rhythm. This is not to say that any speech or work translated into another language will automatically replicate the rhythms of the original. Umabatha, the extraordinary Zulu version of Shakespeare’s Macbeth, for example, does not work in the iambic pentameter, but with its own linguistic clicks, cries, dancing, and dramatic drumbeats, recreates the universal passion, ambition and violence of the original. So rhythms of language do show some cultural variations, but more often they echo, eco, eko, eho, or écho what we fundamentally share.